Skip the hype cycle, recognise your biases and default position as well as other’s biases and default positions to look at problems in context of their changing conditions. This is the overriding message of The Heretics Guide to Management by Paul Culmsee and Kailash Awati. This book was recommended to me by a sage and savvy colleague and friend. It opened my eyes to just how attached I was to certain tools, processes, and practices — namely Design Thinking. This book challenged me to think about just how unproductive we can be when we don’t acknowledge our professional culture wars. If you hold on to traditional strategy methodologies, if you think the latest innovation model is the best way, if you think design thinking is the only way, read this book. A refreshing, humorous, and well researched take on the hype cycle of management and innovation frameworks and why no model is a substitute for understanding context and conditions when working through ambiguity. 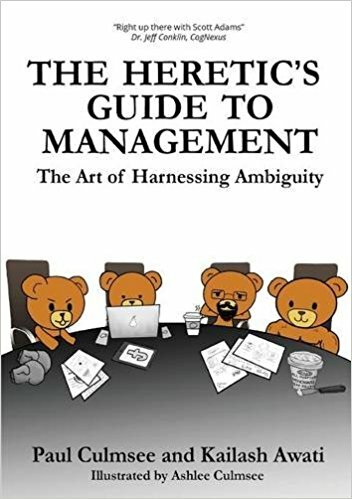 This book’s critique on management trends is underpinned by thoughtful discussion on how we think and how we react to ambiguity; the limits this brings to problem framing, management, and effective work. I came away from this with better critical skills to assess not only my work environment but also myself.